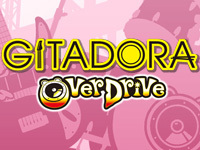 Gitaroda OverDrive, the new BEMANI game by Konami is released today. Gitadora is the new name introduced for GuitarFreaks and DrumMania games last year. The main new feature is the return of long version songs. Fans wanted it for a long time. Battle Mode and Skill System were revised. Players can choose between two ways to play: Light Play that allows you to play 3 songs and supports up to 3 rivals but does not give access to the Battle Mode, long versions and ENCORE/PREMIUM ENCORE stages. And Standard Play requiring Paseli which provides access to these features and supports up to 5 rivals. 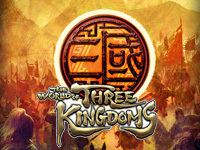 The World of Three Kingdoms is a mix of strategy/action and medal game made â€‹â€‹by Sega that is out today. The story takes place during the three kingdoms period in China (220-280). The game is played online up to 10 and players can ally or compete throughout the country. At the first play beginning, the player create his general that can be customised. After that he creates his army and goes fighting against generals Cao Cao, Liu Bei, Sun Quan, Dong Zhuo and Lu Bu. Thanks to in-game currency, he can strengthen his army (armour, weapons,...). There are four troop types: cavalry and foot soldiers and a "heavy" version of both with better armour. Each class features a special ability: soldiers with light armour can move easily on steep terrain, soldiers with heavy armour can defend the other can defend against a frontal attack,... The cabinet is equipped with three buttons (attack, archers and special) and a lever for moving the troops. The touch screen gives a quick access to the skill/formation icons that allow special moves and reorder the army. There is also a medal side in this game since the player bets an amount on battles and wins gains depending on the result. 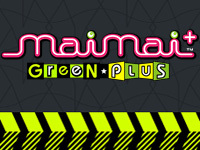 maimai GreeN PLUS will bereleased in Japan tomorrow. This is an update of maimai GreeN, Sega's rhythm game released last summer. Many new songs are have been added to this version with as usual J-Pop, Vocaloid, video games (Sonic Lost World, Yakuza Ishin, Colorful Kotoba), anime (Shingeki no Kyojin, Yowamushi Pedal) but also titles from the Touhou Project and the Joypolis. For the first time since the launch of the series, a collaboration with Namco Bandai is started with the addition of Idol M@aster licensed songs (GO MY WAY!, THE IDOLM@STER 2nd-mix). 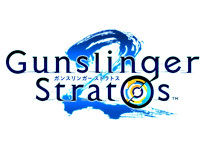 Square Enix released Gunslinger Stratos 2 developed by Byking yesterday. The concept is still the same: two teams of 4 compete and each player uses two weapons, either separately or combined. Four new characters have been added. Riccardo Martini, a 26 year-old Italian soldier member of the special forces. He's a young man with problems. Ayanokoji Sakura, a young girl of 18 years who wields a huge bazooka not very suitable for her size. She has a warm personality. Suno Tsukasa, a young genius of 19 years, head of the special forces. He is charismatic, has the sense of responsibility and justice. Tendoji Sarah, 17 Years old, has a "big sister" temperament and a great sense of Justice. Changes have been made compared to the first episode. A new "awakening" gauge displayed at the bottom left of the screen and which filled in as and damage taken by the player. Once the gauge is filled, the player can activate it by pressing 2 times on the left weapon trigger. Then the player wins temporarily a series of bonus: the "jump" gauge is filled, munitions are refilled, damages are interrupted and the player is invincible for awhile. A "story mode" requested by the players which wanted to explore the world of Gansuto has been added. Thanks to the "Weapon pack tune", the player can choose the level of his weapon pack (when possible). The "rank system" has been reviewed, each player's character has his own rank in the rankings. A new "move assist" system for beginners manages movements so the player could concentrate on the shots. The customization of the characters is more extensive: 10 elements of the characters are modifiable compare to 3 in the first game. Guilty Gear Xrd -SIGN- is available via Sega's ALL.Net P-ras MULTI (RingEdge 2) today. Just like the older titles of the series from Arc System Works, it is directed by Daisuke Ishiwatari (characters, story and music). The game uses the Unreal Engine that allows a full 3D character animation and makes the game graphics really impressive. Twelve characters from old Guilty Gear games are back: Sol Badguy, Ky Kiske, May, Millia Rage, Chipp Zanuff, Venom, Potemkin, I-No, Axl-Low, Zato=One, Faust and Slayer. A new character joins the cast: Bedman. In terms of gameplay, many complicated abilities introduced during the evolution of the series (Force Break, Slashback, FRC) have been rolled back and the basic Roman Cancel System of Guilty Gear games has been improved. This change allows the players to develop new strategies and makes the game more accessible to new players. This year, Metallica will play at Rock Werchter 2014 festival. On Thursday the 3rd of July, they will play the audience's favourites titles at the Belgian stop of their Metallica by Request tour. The concept is simple: an unique code is printed on each concert ticket. This code gives access ti a web page listing all Metallica's song sorted by album. You can then compose your perfect set list by picking 17 titles. The band will play the songs which got the most votes. Click here for the current results for the Belgium date. Why talking about that here? Well, because the same method will be used to select 2 songs that will be added to the 12 tracks already featured in the Metallica pinball. How to vote? 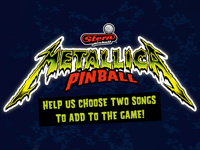 Nothing hard really, just go to pinballvote.metallica.com and submit your e-mail address. You'll then receive an unique URL to choose your titles. The 2 most popular songs will be added in the next software updates from Stern along with program improvements. Voting will close on March 3. At time of writing, the most favourites are Blackened and Ride the Lightning (results). In Belgium, you can play the Master of Puppets Limited Edition model at Wheelie World shop in OOstende and at Flamingo II bar in Puurs (until April for this one). 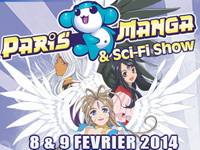 The 17th edition of the Paris Manga show will be held at Paris expo Porte de Versailles this weekend. This show has become a must for fans of Japanese culture over the years but it has diversified its offer with science fiction content. 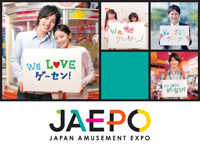 This year, from 9:30 to 19:00 on both days, many activities will be organized. The entry is 11€ for one day and 20€ for two days. Two stages will host various activities such as karaoke, quiz, concerts, conferences, fashion shows, cosplay,... The "sci-fi actors" stage will allow fans to get autographs and participate in photo shoots with many actors from movies and series: David Prowse (Star Wars), Mark Addy (Game of Thrones), Christopher Judge (Stargate SG-1), Colin Baker (Doctor Who)... As guests, we will find among others: Toshio Maeda, Matsubara Hidenori, Jupiter, Samantha Bailly, Sabine Rich,... And on video games side, there will be Namco Bandai Games, Epitanime, Kayane's stand (with tournaments and animations), Nintendo League, DDR Belgium (with 3 DanceDanceRevolution cabinets) and the booth of La Tête Dans Les Nuages with the following arcade games: Winter X Games SnoCross, 2 GRID, Pump It Up NX, Panic Museum, House of the Dead, Guitar Hero Arcade, Blazing Angel, 3 Astro City, 1 Vewlix with Street Fighter and Pump It Up Fiesta on which competitions will be organized. Conventional activities such as Nin-Jutsu, Go and Mahjong will be of course also present. An exhibition on the history of video games opens at Evere town hall (near Brussels) today. 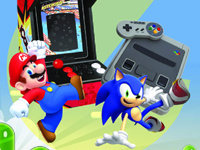 There, visitors will discover the evolution of video games from Pong to Super Smash Bros. Titled Game Over, the exhibition is also fun and interactive because several arcade machines will be available for you to play. You have until Friday March 14 to visit this exhibition. It's located in the Brel hall on the second floor of the Evere town hall (at n°10 on Square Hoedemaekerssquare). The event is organized in partnership with the Retroludix association. Enjoy, it's free! The new Konami's QMA is available today. Two new characters have been added: they are fairies; the girl is called Celeste and the boy Tiar. Their role is to support the player in his studies. As in the previous episode, the player can still choose from 21 characters. A new cooperation system has been implemented: players can now help each other and win Rewards Platinum Medals and magical stones. A new SSS rank is added to the examinations. Online tournament mode is of course still available. 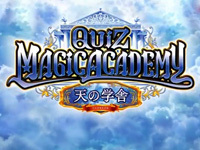 Quiz Magic Academy School of Heaven opening with characters presentation is available here.